By Costa Maragos Posted: December 22, 2016 6:00 a.m.
Student Hany Al Moliya will celebrate Canada’s 150th birthday in a special way, and it’s thanks to RBC. Al Moliya has been selected to take part in RBC’s #Make150Count initiative. Thousands of young Canadians are being given $150 each with one request – to use the money to help communities prosper. Al Moliya is a refugee from Syria and is taking ESL classes at the University of Regina. Participants are being asked to share their stories through photos and videos on social media. “This initiative will showcase the power of young people and how they can make a positive impact in communities all across Canada. Whether it is feeding the homeless, creating an art display to inspire a neighbourhood, giving kids opportunity to participate in sport or buying essentials for someone in need – this powerful and authentic user-generated content will be used to show Canada how young people are helping communities prosper,” says RBC’s Michelle Hoffart, Financial Planner at RBC Wealth Management in Regina. Al Moliya was 17 when his family fled war-torn Syria to live in a refugee camp in Lebanon. It was while at that camp where Al Moliya learned to become a skillful photographer, taking thousands of pictures that chronicle the lives of refugees in Lebanon. The photos become even more poignant considering Al Moliya is legally blind due to a genetic eye condition. 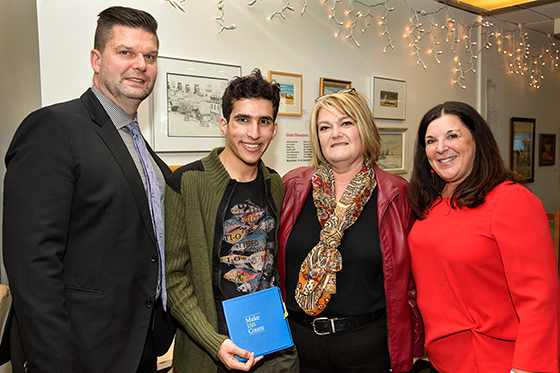 With his family settling in Regina, Al Moliya enrolled in English as a Second Language classes at the U of R.
Al Moliya's story was featured in March, 2016 on the CTV program W5. More recently he was selected a member of the Prime Minister’s Youth Council. The members will advise Prime Minister Justin Trudeau on issues that include employment, education and the environment.